Over 215,000 fans packed into the Red Bull Ring at the 2016 Austrian GP, as MotoGP returned to the country for the first time in nearly two decades. After a weekend of incredible racing against the stunning backdrop of the Austrian landscape, the Grand Prix Commission awarded the Austrian GP the title of best of the year – and the circuit’s incredible infrastructure and facilities are sure to compete for the award once again in 2017. 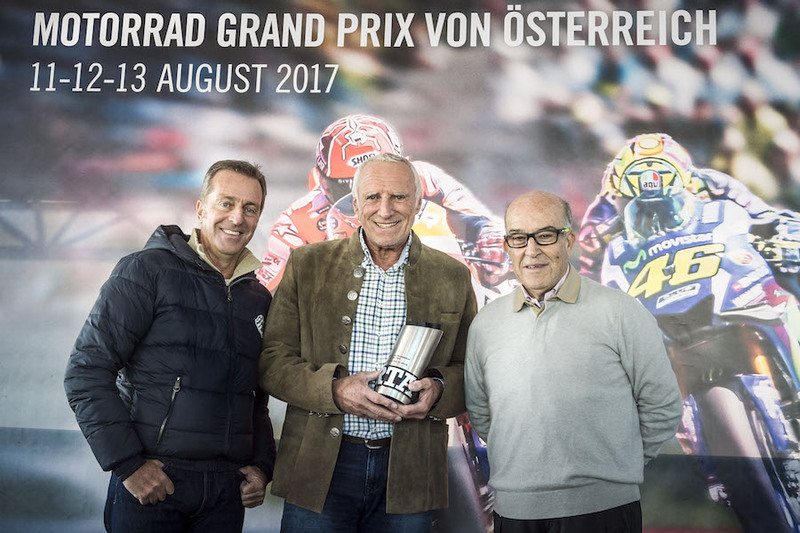 As the build up to the prestigious ski world cup race in Kitzbühel, Austria, gets underway, CEO of Dorna Sports, Carmelo Ezpeleta, and President of IRTA, Hervé Poncharal, traveled to the country to present the award to Dietrich Mateschitz by the start of the famous Streif ski run on the Hahnenkamm. The award was presented just a few days after reigning MotoGP World Champion Marc Marquez (Repsol Honda Team) took his MotoGP bike for a spin on the snow in Kitzbühel –the first rider to attempt such a feat on two wheels.